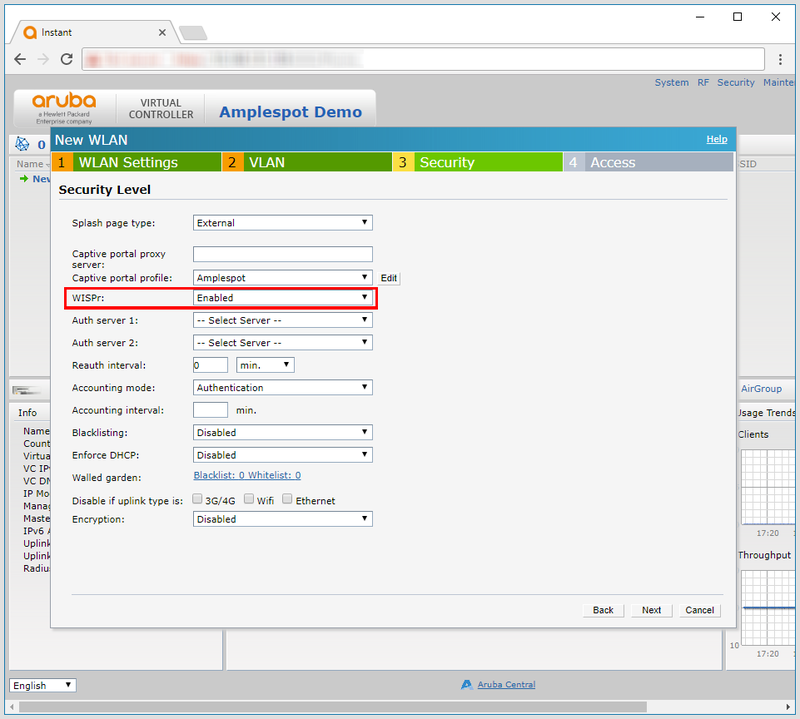 This guide will show how you can set your Aruba access points up to use the Amplespot. It is strongly recommended to use the version 6.3.1.1-4.0.0.0_40930 (released on 2013-11-18) or later. 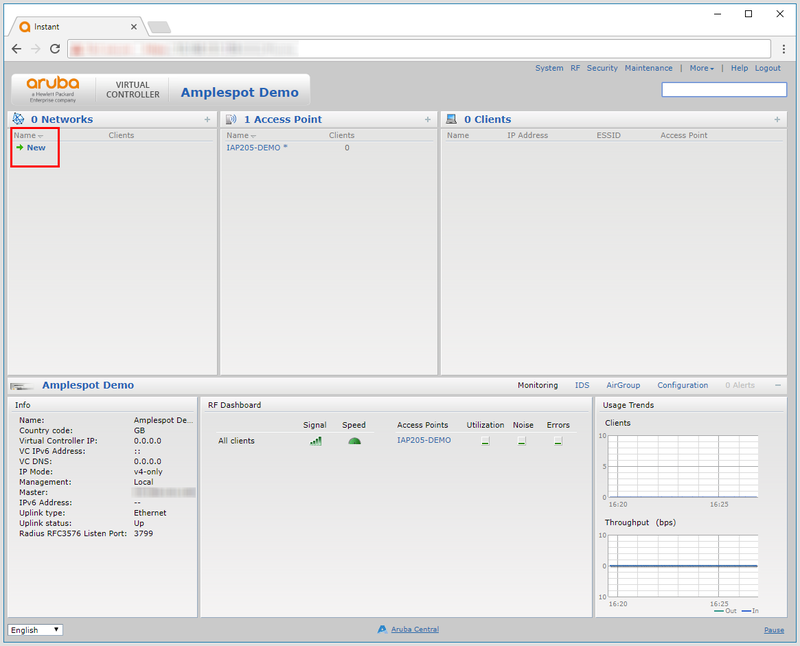 In previous versions, you may encounter problems in communication between the devices and Amplespot. 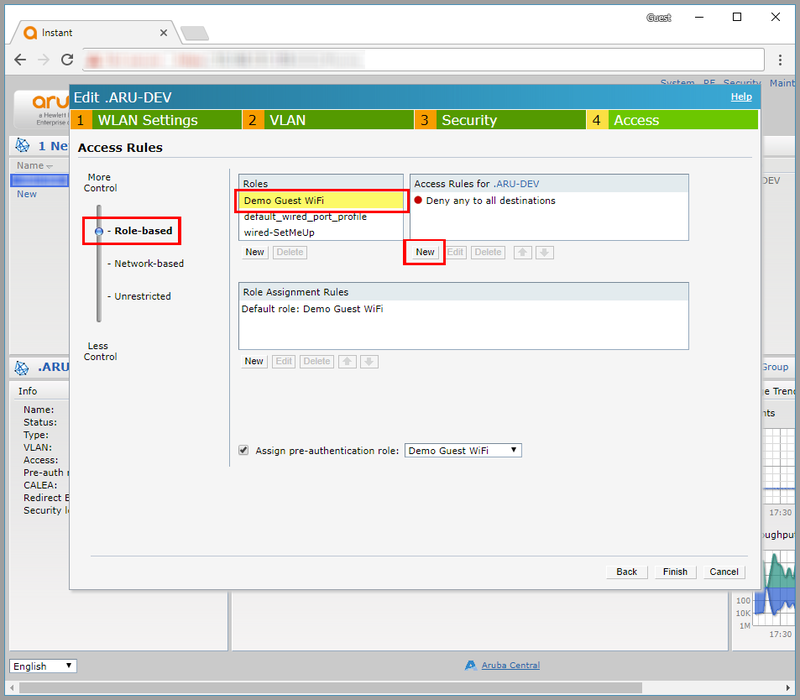 Once you created all necessary Zones, note the MAC address(es) of your Aruba Access Point(s) together with their names. 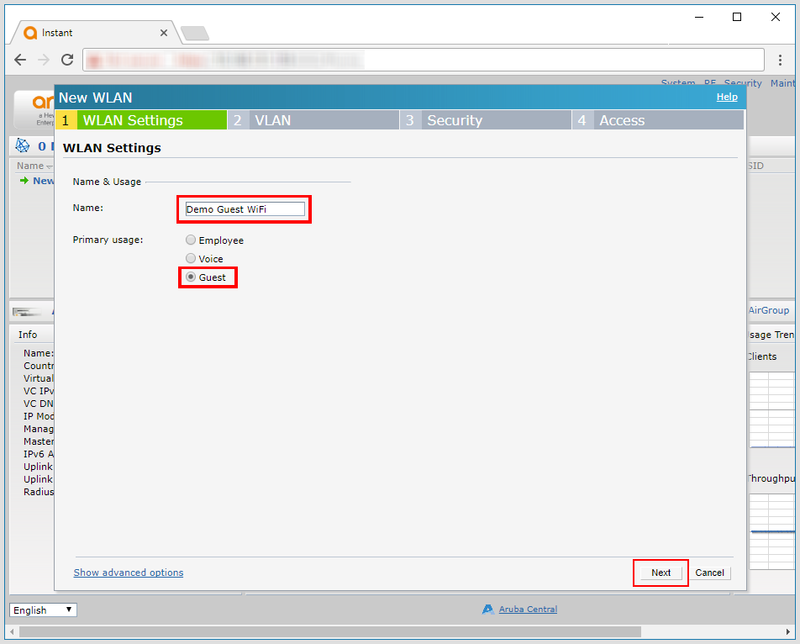 Select the Access Point make and model, type in MAC Address and Name, Select the Country and the Captive Portal Zone where you would like to add this Access Point. You will be able to your access point to other Zones later. !! IMPORTANT!! 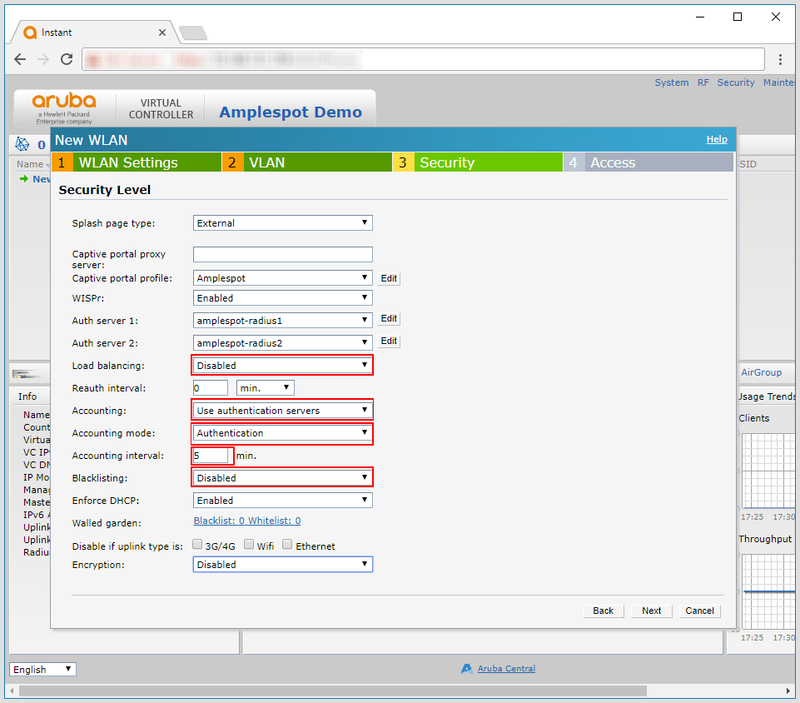 Make sure that the name of the SSID used by the Captive Portal Zone you are selecting exactly corresponds to the name of SSID on your Aruba Access Point. Or you can use other settings depending on the layout of your environment. 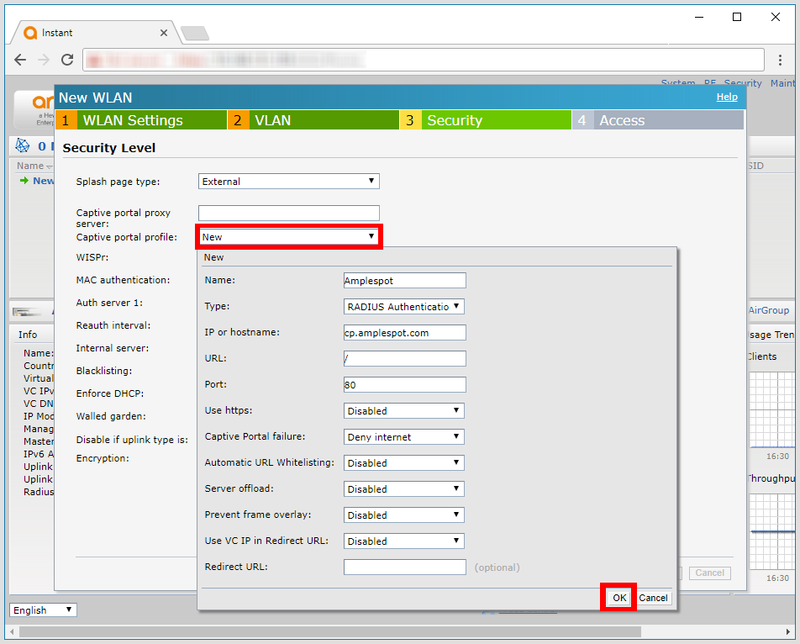 It is important that the clients get IP addresses via DHCP.Click Next to continue. 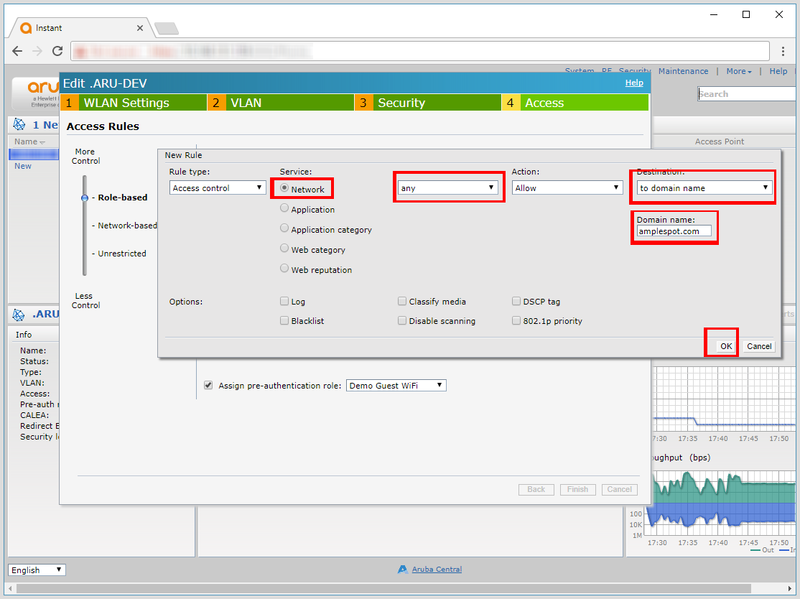 Set the splash page type to External. Under the Walled garden click on Blacklist: 0 Whitelist: 0, the below screen will open. Click New and enter the Walled Garden hostnames as listed here. 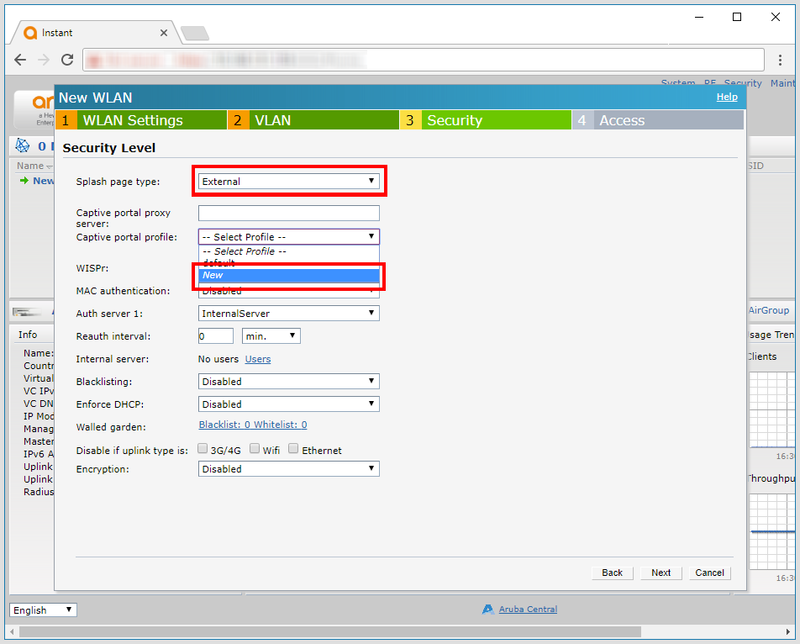 The selection of hostnames depends on the login methods you want to make available to the WiFi users (email, facebook, google, twitter etc). 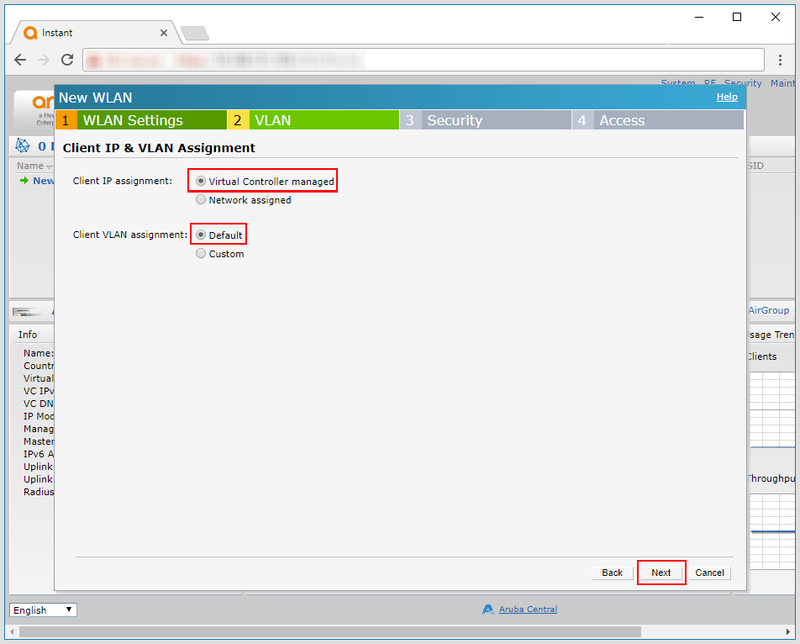 On the Access Rules page set controls to Role-based (should be automatically created matching your SSID), and click New under Access rules. 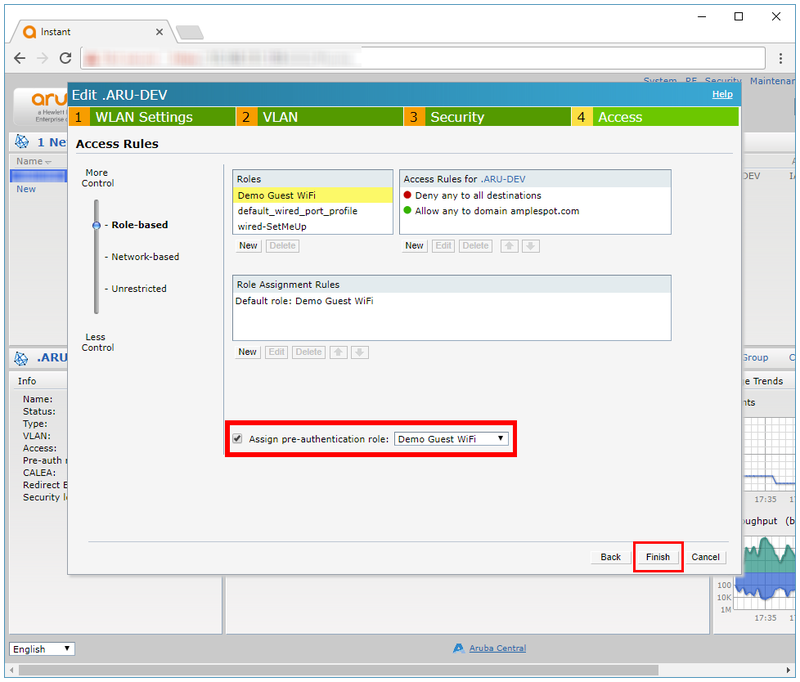 Once you created the rules, tick the Assign Pre-authentication role checkbox, make sure that it has your Role selected, and then click Finish. 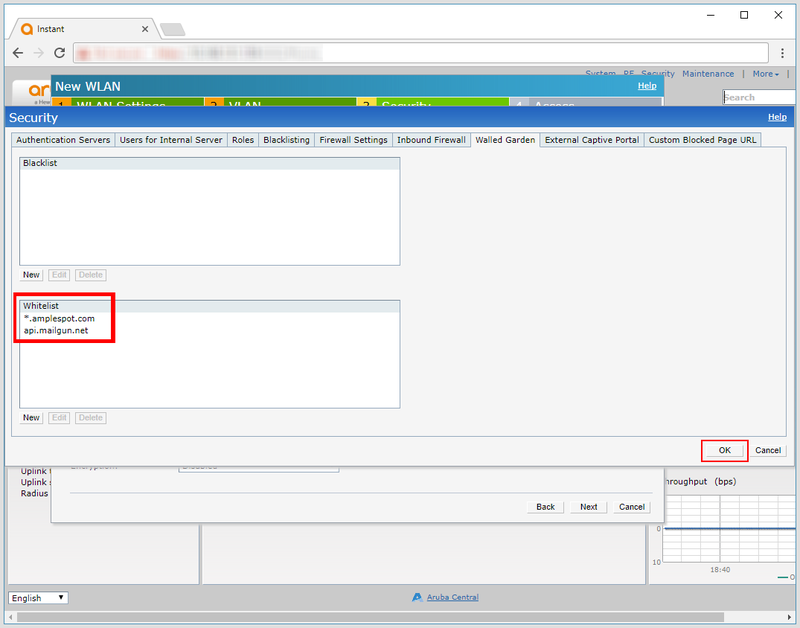 You can set additional Role- or Network- based access restrictions on this page if this is required by your network topology or policies. 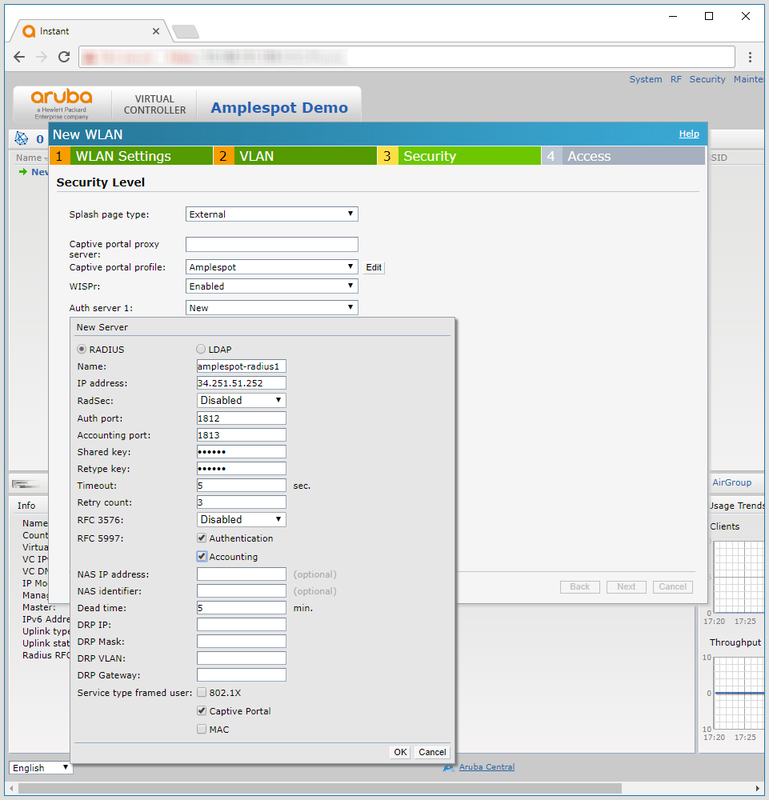 Replace DEVICE_IP with the IP address of your Aruba Virtual Controller, and login with your username and password that you used to log into the Aruba Virtual Controller's GUI.